Ironically I didn’t blog last week because I was at a Social Software Symposium. I was too busy socializing about social software to actually use social software. A Social Software Symposium? I can almost hear you sniggering. Stop it! Stop it right now! 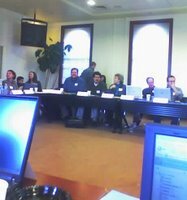 I went to a Social Software Symposium at UNC and I was delighted to be invited to it. “You’re too cynical to be hanging out with the Digg and del.icio.us crowd. You, Cathy Marshall, you open up your leopard-spotted umbrella when a tag cloud darkens the horizon. You think it’s funny when martyd plays fast and loose with Wikipedia truth. You’ve already accused LinkedIn of being the new Amway (Ask not what your contacts can do for you, but what you can do for your contacts). Folksonomies. Folk Singers. Folksonomies. Folk Singers. They’re not all that different. I can see it on the marquee. 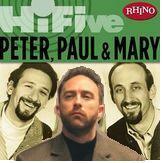 Appearing tonight: Peter, Paul, and Jimmy. Singing Little Boxes Annotate the Hillside, Little Boxes Made of Wiki-Wiki and If I Had A MySpace, I’d friend you in the morning, I’d friend you in the evening, all over this LAN. I’d defriend strangers; I’d defriend wannabes; I’d defriend links between my exes and my to-bes all over this LAN. Yeah. I know. It doesn’t scan. Maybe you could hum a few bars and I’ll fake it. I never promised you a rose garden. If I know you, you suspect my motives in showing up at a Social Software Symposium. 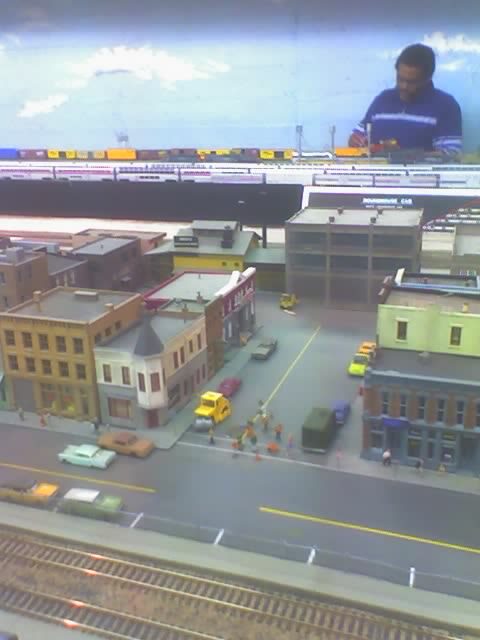 You think I only went so I could visit The Real Paul Jones, Gary Marchionini, Deborah Barreau, Cal Lee, Barbara Wildemuth, Kristina Spurgin and the rest of the gang at SILS. That I was checking up on how Fred and Terrell are doing with ClaimID (I believe the answer to that is “mighty well”). That I was, in fact, doing some social networking of my own. That I drank tumblers full of Maker’s Mark and pretended it was sweet tea. That I stayed in the Carolina Inn and soaked up that Southern hospitality. 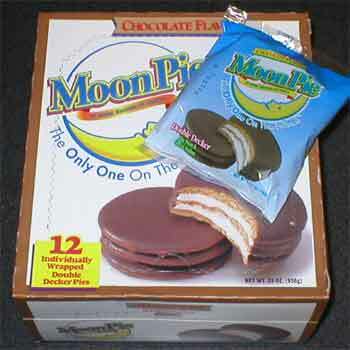 That I ate Moon Pies and filled up on trans fat while it’s still legal. Okay. I’m going to put my fingers in my ears. I don’t want to pick up on any more of your negative vibes. Neener, neener, neener, I can’t hear you! Take your bad energy and go hang out on Yahoo Answers, where all the other smartasses hang out. Anyway you’re wrong. I didn’t stay at the Carolina Inn: there weren’t any rooms left. I stayed at the Siena, with its faux European decor and Italianate student renderings of famous Renaissance paintings. Unfortunately, the Siena is lavish with the paintings, but not with the in-room coffee. 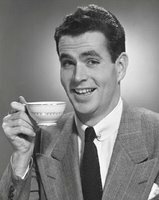 It’s another one of those hotels that believes that its guests must actually leave their rooms to get coffee in the morning. No in-room coffee maker; not even a Signature Gourmet Micro, a product which I just invented, but would’ve been all too happy to buy on Thursday morning. I spent three groggy jet-lagged mornings trying to fake it with Wal-awake Alertness Aids. How can you even find your way out of a hotel room that doesn’t have a coffee maker? Perhaps that’s why I approached the Symposium with such a positive attitude: I spent most of the daylight hours blissfully asleep on my feet. Before the actual event began, many of us attended a talk given by David Weinberger from Harvard’s Berkman Center for the Internet and Society. His premise may or may not be that everything is miscellaneous. It's a snappy title for a talk and it just so happens to correspond to the title of his new book. 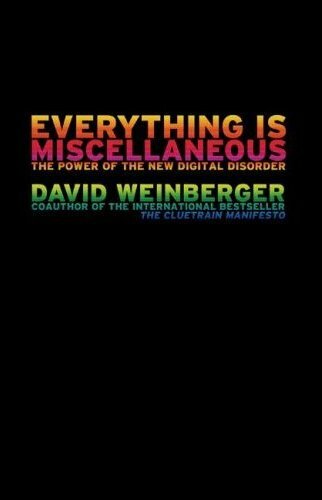 But does David Weinberger believe it? The title is a red herring. He’s not saying that there are no categories as I would’ve inferred. He’s saying that social tagging democratizes categories. So – far from being miscellaneous – he’s saying everything’s exactly what we say it is. No more and no less. But it was a great talk, illustrated just the way I like it. For example, he used a terrific picture of a steer lecturing about cow parts; the steer is giving a chalk-talk about how to cut along the dotted lines and turn a complete and substantial cow into steaks and roasts and tails and tongues. 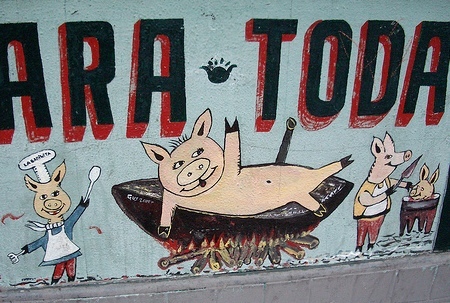 It’s not unlike my favorite pig picture, painted on a shop wall in the Mission, which shows a pig cook, a pig cooking, a piggie butcher, and a butchered piggie. Four pigs, all with great big smiles on their snouts. 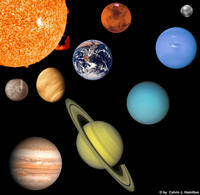 Everyone knows Pluto was ripped off. It’s a planet, okay? 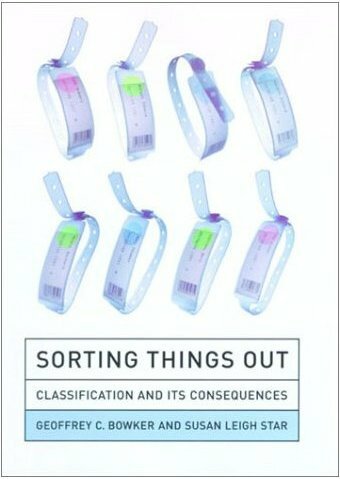 This business about the way we sort things out and the consequences of doing so is a familiar (and very well explained) argument. From a technological point of view, it bears more than a superficial resemblance to our 15 year old rationale for developing spatial hypertext. We'd probably beg to differ about the implications of this everything is miscellaneous argument. We’d say that these untidy heaps have local meaning, but that they don’t necessarily scale to a folksonomic universe. Yeah. 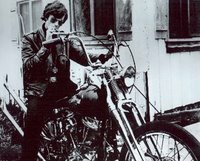 I’m afraid I don’t see folksonomies as particularly subversive (although upon closer examination I have enormous difficulty envisioning Peter Fonda as subversive). Sure, they could be subversive. It’s important how we break what we know into categories. What gets lumped with what. Who sits next to whom on the bus, even if it’s the short bus. What everyday things are called. What embossed labels emerge from the Dymo Labelmaker. It’s likely that I would’ve been more susceptible to this tagging argument ten years ago. Observation reveals just how difficult it is to describe things appropriately for future use – whether it’s for retrieval, to establish provenance, or even just to describe something in a clear way. It’s just harder than it looks. And even if you go for the argument I did – that it’s harmless to have more tags – you run the risk of increasing entropy rather than adding order. So it’s best to take a look at real tags without getting distracted by the abstraction. Abstractions can lead you astray. In the eighties, I fell hard for The Death of The Author; I was a sucker for The Death of Text. So perhaps what we’re seeing now is simply The Death of The Verb. The Death of The Verb. I like it. Tags are, after all, nouns, and very occasionally, adjectives. And coming up with good verbs is what makes writing difficult. I’ll stew over a verb long after all the nouns are in place. Before we go any further, I have a confession to make: I didn’t take that pig picture. I stole it. I remembered it from my wanderings in the Mission and I went looking for it. In my experience, every photo you would’ve taken if you’d had a camera with you has already been published at least half a dozen times. There’s really no point in taking pictures any more; you can even find one that’s as out-of-focus as anything you would’ve taken yourself. Thumbprints on the lens. A hair straggling across the photo. Bad lighting. Blurry. If you can shoot it, you can find it. Good thing that I’m patient. It took me quite awhile to find the photos. And my feeling is that I could’ve found more. Many more. In other words, it’s not the quality of the tags; it’s the quantity of the photos. There are a lot of people who thought the same mural was worth documenting. At first I remembered the mural as graffiti. 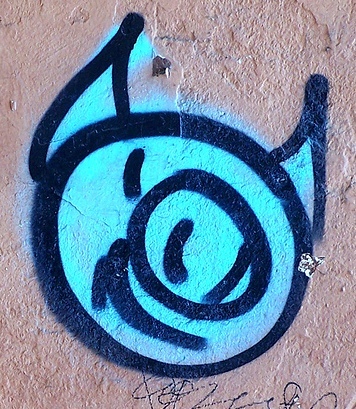 It turns out that there are a lot of photos tagged graffiti and pig. Next page. Next page. Next page. Nothing. Nothing. Nothing. Then I went off and looked for butcher shops. Good thing my Spanish is so poor. Carniceria doesn’t turn up the desired photo until well after you encounter some pictures sufficiently stomach-turning to put you off meat – and off your photo quest – for now and possibly forever. Click. Click. Click. The hours passed. I poured myself a cup of cold Signature Gourmet coffee and drank it fast. Are these tags better than narrative coupled with intrinsic metadata? 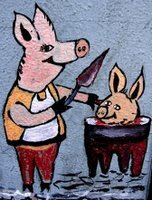 I’m certain most descriptions of the picture would’ve involved pigs and I knew the photo would’ve been snapped on 24th Street between Van Ness and Potrero. I’m not convinced that social tagging’s democratizing influence helped me find my photo faster. But I’m not sure that anyone else believes that, as evidenced by our discussions the first morning of the symposium. Tags, said Thomas Vander Wal, are the geometric intersection of objects, metadata, and identity. And folksonomies are tags one assigns for oneself. So the identity element is crucial. As long as people I know and trust are looking for carnicerias too, I’m in great shape. I felt like an infidel. 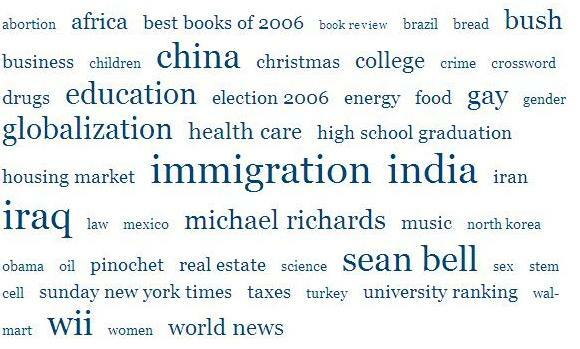 As long as we’ve got tags on the brain, let’s look at the tags people assign to themselves. That’ll combine the symposium’s morning theme of social tagging with the afternoon theme of social networking software. Was it Thomas who said that community arises when there are others who refer to things the same way you do? Let’s see how people describe themselves – where are the lines MySpacers draw to segment themselves into communities? Let’s start with Zachary. He lists Ham Radio, figure drawing, piano, guitar, camping, hiking, fishing, reading, model railroading, anything geeky really!!! And some more: coffee or a movie with a friend, playing with my cat Peaches, daydreaming, Christian theology, sunsets, chickens, tea, massage, philosophy, cats, eBay, fountain pens, mountains, people watching, cigars, San Francisco, singing, music composition, quiet time, warm baths, hot showers, science and religion debate, cheesy love songs, wine tasting, cooking, hugs, waterskiing, long drives, coffee shops, and Airsoft. He’s friended Eduardo, who lists reading books from post-modern writers, drinking coffee at Coffee Cat, Golf, boating. Riding my motorcycle that I don't have yet, but hope to get once I talk my wife into letting me get one. Hiking, walking with my wife. Eating pizza. We learn during the afternoon that this friending business is serious stuff, but not nearly as serious as defriending. It’s easier to accumulate 27,249 friends than it is to explicitly sever these social ties. And it’s easier still to make a misstep if you engage in drunk FaceBooking, which would seem to hover somewhere between drunk dialing and drunk driving on the spectrum of social taboos. Did you really mean to tell EVERYONE about who you friended last Friday night? Really? Did you know, like, he friends anything that moves? After all is said and done, what I wonder about this flurry of social networking activity is what we’ll want to keep twenty years from now. I’m not worried so much about the shared bookmarks and the language of the tags – those surely will have changed. But what about those FaceBook pages? Are they transient? How about those YouTube videos? How about the comments on your MySpace page? Do those even belong to you? I have a certain amount of stuff I’ve saved from earlier periods of my life. I didn’t save this stuff intentionally, but it’s just the sort of ruminations and connections that you might record in FaceBook. Some photos a friend took when we went to the beach in Santa Cruz together and rode the merry-go-round. Clippings from that Hot Tuna concert at the Starwood. All kinds of things I might’ve forgotten. I’m delighted to see them. But there’s so much stuff on the social networking sites. How much of it will the social networkers of today even want? Will a forty-plus year-old Brookers want her lip-synced video of My United States of ... WHATEVA (which has amassed 617,032 viewers)? Will Zachary care that he favored warm baths in 2006? (It sounds much snarkier to be interested in cold showers.) Will Eduardo care about the comments his friends sent him while he was in Maui? (“You're in Maui!!!!!!! I'm SOOOOO JEALOUS!!!!!! Okay, and I love your video- hilarious! It reminds me of my days in cheer- only they're probably way better than I was! Hahahaha!!! I miss your family!! Have an amazing vacation! Love you guys! Blessings!”) Will the weight of 24 exclamation points be evocative in 2026? Does Eduardo even own his friends’ comments? Social software brings with it unaccustomed baggage and artifacts. They’re perhaps weightier than they are worthwhile – luggage you would check and not care if the airlines lost it. But these artifacts may be all we have: they are the postcards we used to send; they are our vacation photos; they’re notes the notes we passed in school; the mix tapes we made for each other. I bet we’ll want to save some of this ephemeral stuff. And I bet – unless we do something right now – we’ll lose most of it. We already cede rights to it to corporations that make no promises about what’ll happen to it if the next quarter sees a downturn. How are you saving your identity? Your social noodlings? Your video blogs? Your friends and defriends (“Oh no! I friended a slimebag”)? Your data and your metadata? Your nerve profiles and your lifehacker lists? How else will we remember that Susan Lucci is the daughter of Phyllis Diller? What I fear most is that out of all of this recorded ephemera -- every documented bit of our real social interactions -- the artifacts that will survive are not yours and mine, but the commercial ones, the lonelygirl15s (but not the 10ne1ygir1l5s) and that goddamned Mouse. Maybe there is some way of making the tagging process less idiosyncratic? Encourage a second person to add tags, build a giant sieve that drops things into LC subject headings, make it cool to consult a controlled vocabulary list? Or is that just like trying to get open-mic coffee-house folksingers to keep to a beat and stay in tune?